I have no clue why it still scares me so much. Especially since I've seen so many more gruesome monstrosities in actual horror games. It's like my fear of dolls and clowns. Illogical childhood fears that I can't shake. The fact that Link should be dead the second he stepped foot in Termina honestly doesn't help. 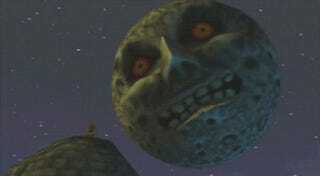 If the moon was that close, more likely then not Termina would be completely flooded and the gravitational forces exerted by the planet and moon on each other would cause the planet's orbit to become screwed up beyond belief, causing all kinds of extreme weather and natural disasters. And even if Termina doesn't abide by the laws of physics, that moon is way too small and falling way too slowly to actually destroy the planet. At worst, Clock Town would be destroyed. .... okay, sorry, that aside, this thing still scares me and it really shouldn't.